As most of you know, a major focus of the Chattooga Conservancy’s work for the past year has been fighting the Southside Project, which was initially proposed by the Nantahala Ranger District in March 2017. The Nantahala Ranger District manages our national forest land in the North Carolina headwaters of the Chattooga River watershed. The proposal covers a large area—about 29,000 acres—near the Chattooga National Wild & Scenic River, Ellicott Rock Wilderness Area and Terrapin Mountain Potential Wilderness Area, as well as other biologically rich wild areas of the Chattooga River headwaters, and even reaches over into the headwaters of the spectacular Whitewater River. The project is a throw-back to the days of old-school forestry, based on intensive timber harvesting, road building, heavy use of herbicides and prescribed fire. A main component of the project involves cutting old growth timber. The Chattooga Conservancy and students with the Highlands Biological Station conducted months of field work documenting old growth trees that have been targeted by the Southside Project. We have met all deadlines for the Forest Service’s formal comment process for the project, starting back in March 2017, to now. We have also gone to great lengths to keep the public informed about the potential harm that will result if the Southside Project proceeds, in terms of the loss of biological diversity and rare old growth forests. Consequently, citizens have filed a record number of comments against the Southside Project. 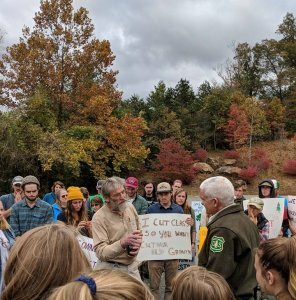 Just a few weeks ago on November 1st, the Supervisor of the Nantahala-Pisgah National Forest, Alan Nicholas, invited 30 individuals and organizations that had met all the deadlines for commenting on the Southside Project to an “objection resolution meeting” at Forest Service headquarters in Asheville, NC. Other members of the general public were allowed to attend, but not allowed to speak. Many folks who sent letters opposing the Southside Project but didn’t meet every single deadline felt disenfranchised, because they weren’t allowed to participate in this meeting. So we organized a public forum and protest rally outside the Forest Supervisor’s office. At least 80 people—including a class of school kids—participated in the rally, carrying posters and singing songs objecting to the Southside Project. We appreciate that Supervisor Nicholas came out to the parking lot after the objection resolution meeting, to hear concerns from the public at large. The protest rally was lighthearted and respectful, but the public made it clear to the Forest Service that they were firmly against the project, and were concerned in particular about cutting old growth. The rally was covered by Asheville’s WLOS TV station, and articles were published in the Crossroads Chronicle (Cashiers, NC) and The Highlander (Highlands, NC). Media coverage of the important issues was favorable, and included comments that the students attending the rally got a good lesson in civil protest. We hope the results of both the objection resolution meeting and the protest rally got the Forest Service’s attention. Perhaps this was reflected in a recent Forest Service letter, that stated it would be necessary to delay their response, to allow adequate time to address all expressed concerns. Regulations indicate the Forest Service should respond within 90 days from the end of the formal objection period. This would mean that the Forest Service has until November 26th, the first Monday after Thanksgiving, to issue a decision, but this may be delayed further. So stay tuned: we will let everyone know when we receive the Forest Service’s response, and what it contains. Next steps: If the Forest Service does not change the Southside Project to address our concerns, we have legal “standing” to take them to court if necessary. The Forest Service has said that the Southside Project, if approved, would not be implemented until 2020 or later. In the interim, there are other actions we can take, based on the pending response from the Forest Service. So, have a Happy Thanksgiving and thanks to all who have joined in this fight to protect the national forests in the Chattooga River headwaters!